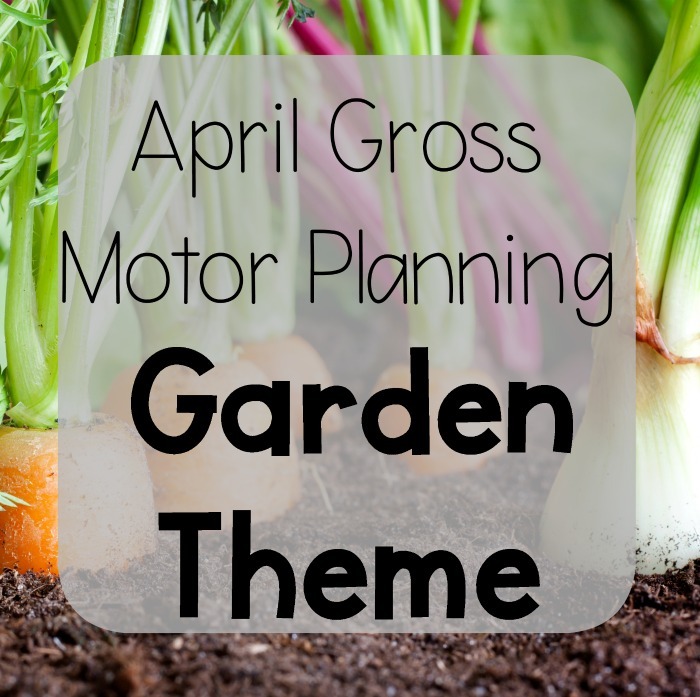 Spring is officially here and April is the perfect time to add all the fun spring themes to your gross motor programming. 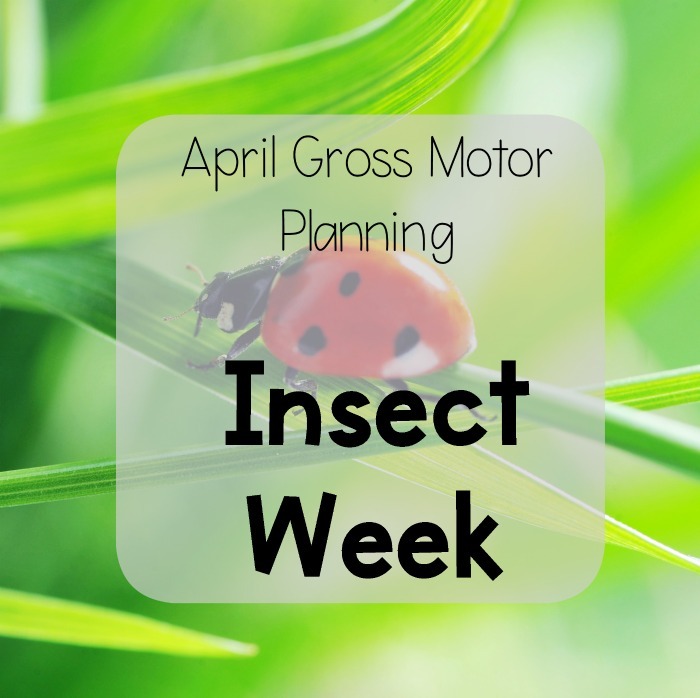 This April Gross Motor plan includes Insects, Bugs, and Creepy Crawlers theme, Garden Theme, Farm Theme, and Zoo theme. It also includes bonus ideas for Easter as well as Easter printable Freebies! 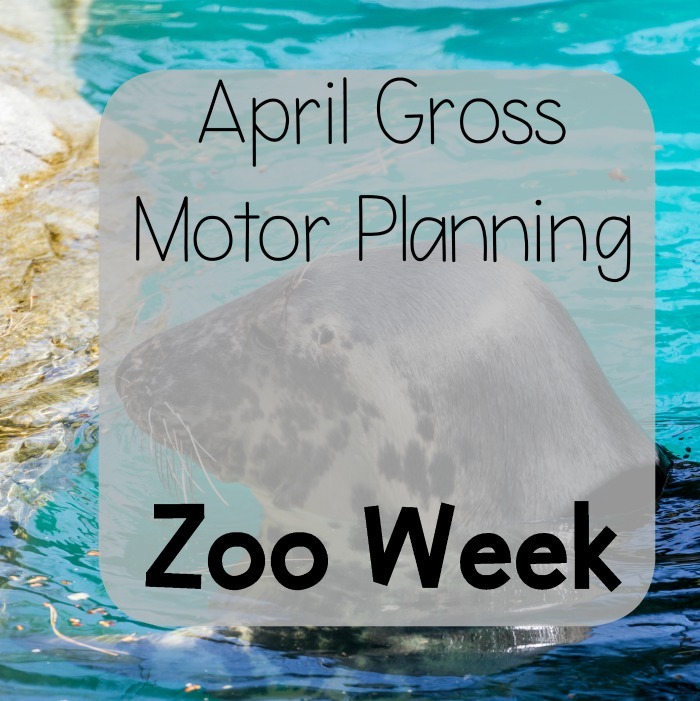 Check out all of the fun ideas for your April gross motor activities planning! Using themes can make gross motor time fun as well as easier for you to set up. Breaking them down in weeks can add some order. It’s okay to have some of the themes overlap a bit and they don’t need to be in any certain order. There is no hard and fast rule about how many activities need to be done. A trip to the zoo is the perfect way to enjoy the weather getting nicer. It’s also a great theme for gross motor planning! Start with zoo themed yoga pose ideas. These are simple and fun ideas. You will love these if it’s your first time trying yoga or a seasoned yogi. You can get Zoo Themed Yoga Cards in both the clip art version and kids version. Try the elephant stomp as a fun zoo themed gross motor game. Try a penguin waddle relay – Get into two teams. Have the first player place a ball between his/her knees and try to race across the room and back. When the player gets back the next goes. The first team to have all of the players get down and back wins! Zookeeper Says – A fun spin on Simon Says! Try these different animal moves! Check out these Animal Moves – Get them in a clip art or kids version! Try out this core strengthening activity by making the animals fly. April is a great time on the farm with all the new life at the farm! It’s also a fun theme to add in the spring to gross motor planning. Start with farm themed yoga and moo-vements. A fun way to move like the animals on the farm! Get printable yoga cards in the clip art version or kids version! Check out the animal herding idea! If you don’t have or can’t use balloons use balls! Farmer Says – Another spin off of Simon Says. Try herding animals using a pool noodle and balloons. Great for eye hand coordination. Draw fun animal faces on the balloons and try to get them into a fenced in corner using the pool noodles to bat the balloons into the corner. Sheep shearing is a great way to work on squatting to standing. It would also be easy to incorporate into a relay. 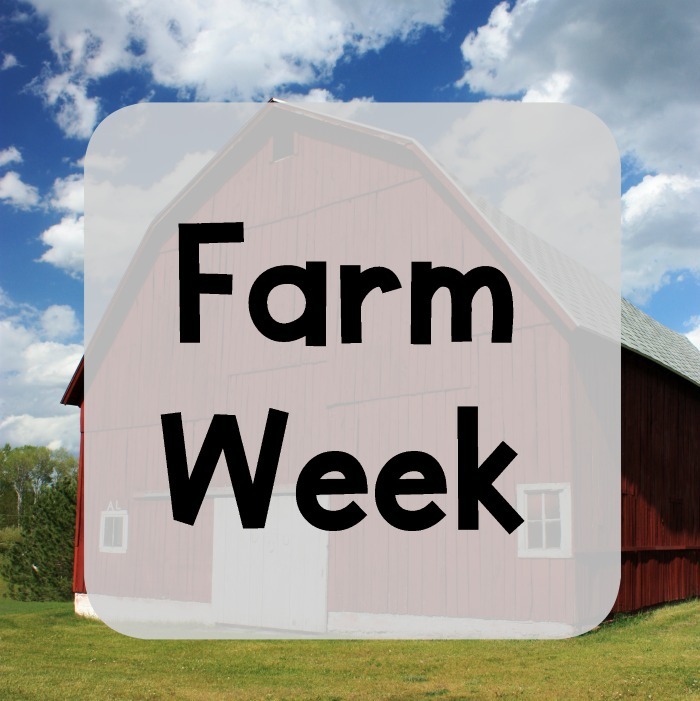 Another easy relay idea – farm animal or not farm animal activity. Teams could easily race down to place their animal in the correct bucket before racing back. 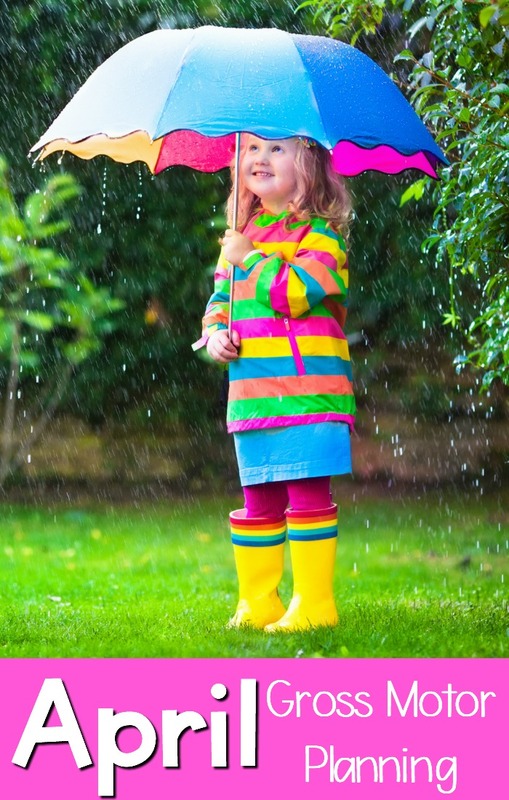 Do you ever remember going outside as a kid looking for worms after a good April rain? With the warmer weather in April also brings the return of some insects, bugs, and creepy crawlers! Start with insect, bug, and creepy crawlers yoga pose ideas. These are so fun and no need to be a yogi to enjoy these fun pose ideas! The cards and printables are available in a clip art version and kids version! The bumble bee relay is a fun game to play to get the kids moving! Use a fly swatter and run around swatting objects. This can be done with the objective of your choice. This may mean you use sidewalk chalk to write different letters and have the kids swat a certain letter. Maybe you opt for numbers. This is a great option for moving and learning! Perfect for balance is the spider web gross motor game! Try stomping out the bugs. This can be done by drawing bugs on the sidewalk and jumping, stomping, hopping etc on them. This is a great way to work on different gross motor activities. A bug hunt! This is fun game where you can hide bugs and have a checklist of the different bugs that you need to find. You can incorporate even more gross motor into this by having the kids skip, run, or jump to the next bug! One of the best parts for spring is garden planning. A garden is truly amazing to watch how a big pile of dirt can grow such wonderful vegetables and fruit in a matter of months! It’s also a fun theme to add to gross motor planning! Start with garden yoga pose ideas. These are so fun and no need to be a yogi to enjoy these fun pose ideas! The cards and printables are available in a clip art version and kids version! Garden tag is a fun gross motor activity to try! Flower number line is a great way to incorporate learning and gross motor into the garden theme! The wheelbarrow relay is another fun way to incorporate gross motor into a garden theme! Rabbits and gardens are a common combination! Check out the rabbit hole game for some garden gross motor! The bumble bee relay would also go really great in the garden theme! This would also be a great opportunity to use stepping stones (affiliate like these) to walk across stones/paths/gardens. The month of April often times brings Easter! Fast, fun, and effective describe these fun brain break ideas all with an Easter theme! Be sure to check out ideas for Easter Yoga Poses and get your free Easter Yoga Cards in the Freebie Library.